People who cannot recognise a palpable absurdity are very much in the way of civilisation. One of the common themes we have spotted it that many of the readily available tools don’t provide their users with any significant edge. If the indicator is easy to use and easy to master, that means a plethora of individuals will be relying on it to give them some advantage over the masses. What they fail to understand is that they are the part of the mass, they are trying to outwit. 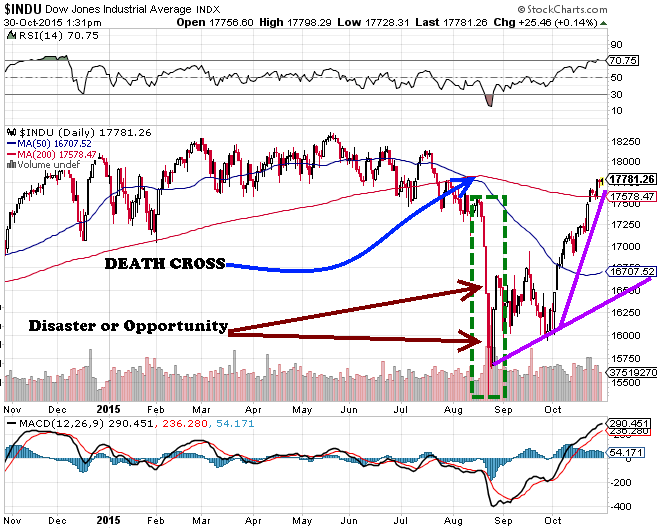 A lot of chatter has sprung about lately regarding the death cross. First, it was the Dow, and now there is talk about the U.S dollar. This tool like the “Hindenburg Omen” is for the most worthless. Other than the cool names they carry, they offer little regarding value: they are both easy to master and understand and this, in essence, renders them useless. For those not familiar with the term death cross, it is a technical indicator, and it occurs when an index or stock’s 50-day moving average falls below its long-term moving average, which is usually the 200-day moving average. The talking heads would have you believe that the end of the world was nigh. As usual, when this occurred this year, they came out of the woodwork screaming bloody murder. Like a broken clock, they appeared to be right for a moment of time, but then reality hit, the illusion vanished, and they ran back into the woodwork when the market reversed course. Take a look and determine what it represents to you, disaster or opportunity. When we look at it, we do not see anything dangerous or anything to fear. Once fear takes over you are paralysed and rather than acting in a way that produces rewards, the result is usually failure and loss. Now to be fair, if you are nimble, then one could make money shorting the markets, but you would have to be pretty agile; something that is easier said than done. Look how fast the market reversed course. Using the Dow as an example, if one had shorted the Dow based on the so-called “death cross pattern”, the outcome would have in most cases been far from perfect. You would have jumped in based on the signal, but what would have been your signal to jump out. If you did not move quickly or were waiting for a trigger to nullify the “death cross”, you would have lost of the potential gains, and this is assuming that you managed to get in at the precise moment the signal was triggered. We believe that time would be better spent by making a list of stocks to buy, for the upside gains usually dwarf those made from shorting. History is on your side too. Over time markets trend upwards, and not downwards. At the Tactical Investor, a death cross is a buying event, time to break out a bottle of champagne and celebrate alone, while the masses are busy chanting death to the markets. Take the time to understand that disaster is the code name for opportunity, and that the masses are never on the right side of the markets for any given period. Be happy when the masses panic, and panic when the masses are happy. We teach how to use Mass psychology to your advantage, how to view disasters as opportunities and how not to let the media manipulate you and direct you towards actions that could be detrimental to your overall well-being. Visit the investing for dummies section of our website; it contains a plethora of free resources and covers the most important aspects of mass psychology.If you cling to the mass mindset, the top players will continue to fleece you; the choice is yours; resist and break free or sit down and do nothing.